Falcon 9's second stage engines have shut down and its mockDragon 9 capsule has reached orbit. Falcon 9's first stage has separated from the second stage,which will continue traveling to space. SpaceX has lifted off its Falcon 9 rocket on its inauguralflight. A new launch target time for SpaceX's Falcon 9 rocket hasbeen set for 2:45 p.m. EDT (1845 GMT). "Everything looks good for a reset and another launchattempt today," SpaceX commentator Robyn Ringuette said. A new launch target time has not been set yet, but SpaceXsays it still has time to recycle the countdown and try again to launch itsfirst Falcon 9 flight. SpaceX aborted its planned launch test of Falcon 9 when aglitch showed up at the very last minute. There could still be a chance to tryagain today, SpaceX said. The countdown has resumed toward a launch for Falcon 9 at1:30 p.m. EDT. 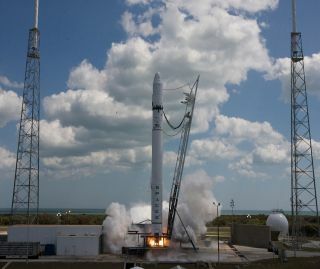 SpaceX is now aiming for a launch of its Falcon 9 no earlierthan 1:30 p.m. EDT, allowing time for a? boat that had strayed dangerouslyclose to be moved clear to safety. A boat has apparently strayed too close to the Falcon 9launch pad, further stalling the planned liftoff. SpaceX is working to resolve the telemetry issue for apossible 1 p.m. EDT launch time. The weather remains go for launch. SpaceX is trying to sort through an issue with theinformation coming from its Falcon 9 rocket. The strongback structure onthe launch pad has been clocking telemetry signals from the vehicle, thecompany said, so SpaceX is troubleshooting that issue now. Click here for launch commentaryfrom Spaceflight Now. Commercial rocket firm SpaceX is still holding in thecountdown to launch its Falcon 9 for the first time. The rocket is fully loadedwith its liquid oxygen and liquid kerosene fuel. "Weather continues to be favorable for our launchtoday," SpaceX commentator Robyn Raguette said. "We are still waitingfor our new T-zero time." The inaugural flight of the Falcon 9 rocket is still holdingat T-15 minutes. SpaceX commentator Robyn Raguette says the range has askedthem to hold to check telemetry. The rocket and weather are currently in green,or "go" conditions. SpaceX has pushed back the planned liftoff time of itsFalcon 9 rocket, which was slated to launch at 11:20 a.m. EDT. The range isasking the company to hold while they check out telemetry connections. Thecountdown is currently holding at T-15 minutes. The countdown is underway for the first launch of SpaceX'sFalcon 9 rocket today. Weather forecasters predict a 60 percent chance offavorable weather for the flight. Private company SpaceX is preparing to launch its Falcon 9rocket on its maiden launch test this morning at 11:20 a.m. EDT (1520 GMT). Thecompany has a four-hour window in which to launch.